Posted on Fri, Mar 30, 2012 : 10:14 a.m.
A little rain isn't going to stop Ann Arbor from acting Foolish. Organizers of FoolMoon, the parade of homemade luminary sculptures / street party set for this evening in downtown Ann Arbor, have announced plans to deal with a somewhat iffy weather forecast. The forecast calls for a near-certainty of rain today, with rainfall up to a third of an inch. A chance of rain remains throughout the evening. Weather Underground's hourly forecast currently lists a 100 percent chance of rain at 8 p.m., with a temperature of 39 degrees. "That's right—they'll be handing out fashionable plastic rain gear and fancy little umbrellas to everyone who brings their lovely luminary sculptures to any one of three 'Constellation Stations' Friday night. At 8:15 p.m., revelers meeting in front of Kerrytown Market, the University of Michigan Museum of Art, or Slauson Middle School will join hundreds of luminescent friends heading downtown towards the Grizzly Peak Tent on Washington Street in Ann Arbor. "Foolhardy souls will be warmed by dancin' in the rain, munching MoonPies, quaffing FoolBrews, and generally indulging in an evening of wet and wonderfully glowing surprises!" 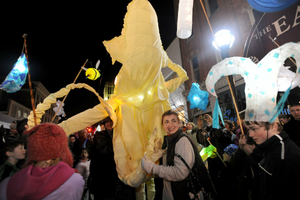 FoolMoon, introduced to great success last year, is an outgrowth of FestiFools, a parade of large puppet-like creations set for 4-5 p.m. Sunday on Main Street downtown. Sunday's weather forecast is more favorable, with just a 30 percent chance of rain and a high temperature of 64 degrees. Check out past coverage of FoolMoon / FestiFools here, including a preview article on all this year's plans. And for more information, check out the FestiFools website. For full weather information, see the AnnArbor.com weather page. Fri, Mar 30, 2012 : 8:02 p.m.
Oh, I'd forgotten about this when I made dinner plans tonight. Looks like I need to find somewhere else to go. Fri, Mar 30, 2012 : 7:31 p.m. The rain will stop and we'll have a wonderful time at the Fool Moon Festivities!!! Fri, Mar 30, 2012 : 9:09 p.m. It will? I am seeing rain until 9. Won't find me out in this weather. Stay dry everyone. Fri, Mar 30, 2012 : 4:32 p.m. The show, HMS Pinafore at the Mendelssohn Theater tonight at 8pm, sounds like a great alternative if the weather continues to be poor. Fri, Mar 30, 2012 : 3:50 p.m.
For those of you who don't want to stand in the cold and rain, consider checking out UMGASS's production of HMS Pinafore playing tonight at 8pm at the Mendelssohn Theatre in the Michigan League! Opening night last night was fantastic...don't miss out! Tickets and more information are available at www.umgass.org, or you can buy tickets at the door.